Texas up 11-0 in 2nd chance points. #KUBBALL thinks FT's are dumb. UT takes the lead after hitting another 3. 6-16 in the game so far. 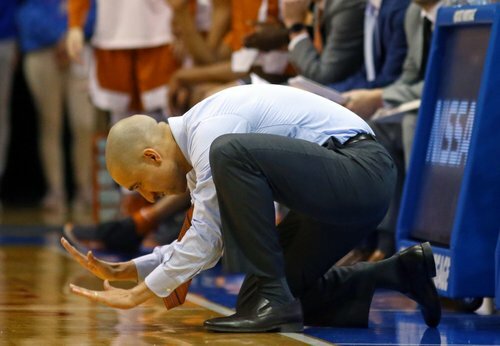 And just like that, the Longhorns are on top and #KUbball wasted another great start. 30-29, Texas. 4:12 to play 1st half. Timeout Self. Wow. 6 offensive rebounds and 11 2nd-chance points for Texas already. Dear Texas - Marcus Garrett is your daddy tonight. Did he flip the crowd off after that? I'm not sure how Higgins called that on Grimes. #KUbball is 2-of-7 at the FT line tonight... Texas has not shot one. HALFTIME at AFH... After an up-and-down (the floor) first half, Texas leads No. 7 #KUbball 39-38. Officials are at the monitor and may be checking a late Vick 3-pointer to make sure it was a 3. McCormack putting in some work. First an offensive rebound to maintain possession. Then draws a foul in the paint by boxing out. Next possession, McCormack posts up hard inside and scores with a little jumphook. Really good stretch for McCormack there... Couple of offensive boards, one foul drawn and that post jumper. Timeout UT. #KUbball leads 55-47 with 12:24 to play. Marcus Garrett now with 913 points. Grimes dump off pass to Dedric was pretty. The over the back no calls are tremendous tonight. Texas not done yet. Trims it to 69-64 with 4:13 left to play. So KU has decided to just quit playing defense...especially on the perimeter shooters! Ochai Agbaji grinning and jumping up and down clapping after seein Marcus Garrett force a jump ball. #KUbball survives a wild finish at AFH... Texas misses a 3-pointer at the buzzer that would've won it. 80-78, Jayhawks in a thriller. KU goes dumb so easily!